Any beer that conjures memories of the time it took less than two-and-a-half minutes of Fight Test for The Flaming Lips to become my new favourite band back in 2002 (and, with hindsight, change everything) is off to a good start. OK, so the lyrics there namecheck “sunbeams” and “starlight” but, in combination with a label that would make a fitting backdrop for one of the Oklahomans’ live shows, that’s where this beer started before it even landed in a glass. The beer itself is a table beer, a European concept that we’re starting to see with a little more frequency over here; essentially, beers that are mid-strength in size and typically Belgian/farmhouse inspired in construct. Here, it’s a gently kettle soured saison, one with a rounded, sweet bready aroma with just a hint of spice that’s light and cleansing on the palate – the souring is more of the refreshing than puckering sort – yet still offers up a little malty sweetness and estery complexity too, making for another addition to the increasingly diverse collection of sub-4 percent ABV beers appearing across the country. 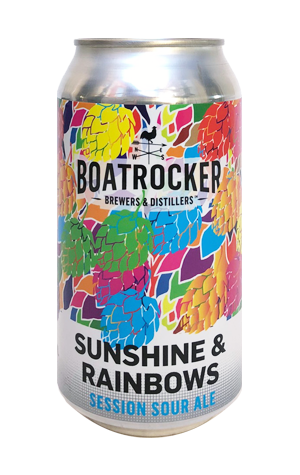 UPDATE: As summer 2018/19 approached, Sunshine & Rainbows was popped into cans and joins the Boatrocker core range.